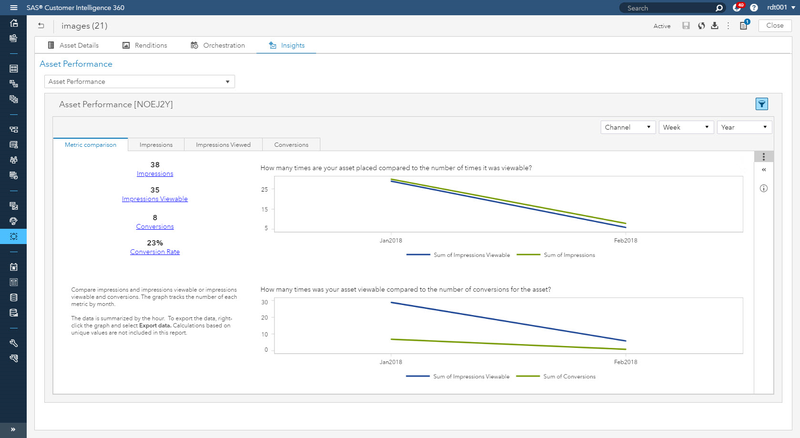 Editor's note: Learn more about SAS 360 Plan, the latest addition to the SAS Customer Intelligence 360 solution. We all know that digital platforms have transformed the role of marketing in the last few years; however, in many organizations, marketing operations hasn’t kept pace with that innovation. Marketers need to be able to quickly respond to what’s happening in the market, but they sometimes struggle to plan and execute in an agile manner. The number of customer touch points across all channels has dramatically increased the need for content. At the same time, customers expect more from content – they expect it to be personalized to match their interests and context. The good news is that better-connected customers should translate into more growth opportunities. Customers are connected through many channels, including social media, mobile apps, and various websites, and they interact with their favorite brands on a regular basis. This level engagement provides more opportunities for growth both in terms of additional spend per customer and the potential to acquire new customers through recommendations on social media. 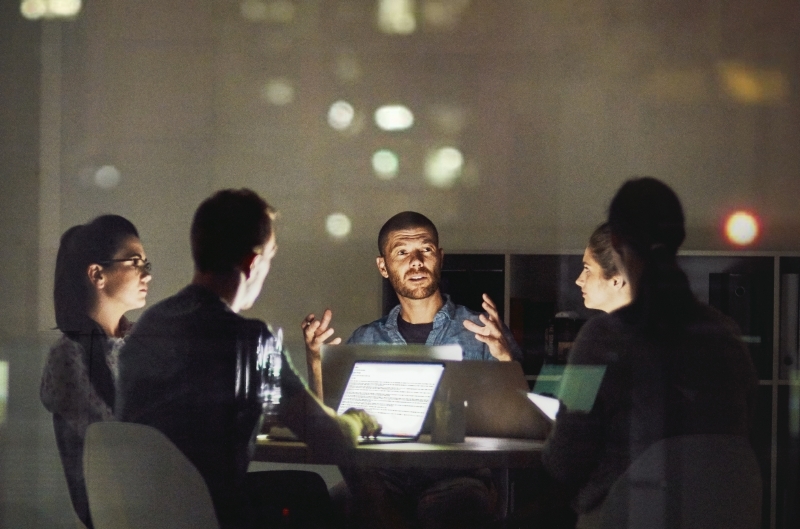 Many organizations recognize these growth opportunities, and as a result, marketers are being challenged to connect their activities and investments with expected outcomes and ROI. In fact, with the proliferation of ecommerce, marketing is often viewed as an extension of the sales team. This perspective can lead to goals and expectations associated with sales and profitability rather than simply lead generation. Marketers also need to continue to work within limited budgets and ensure spend is allocated to the most effective activities. Unfortunately, many marketing teams can’t make the required connections to act on the opportunities associated with highly connected customers. Strategies, plans, and content aren’t always integrated or aligned across teams and channels. It can be challenging to efficiently move programs and activities from the planning phase to execution. Often, marketers lack the data and tools needed to evaluate performance holistically and guide future planning decisions. Ideally, they also want a centralized place to manage it all. They would prefer not to have to switch across multiple systems just to perform daily tasks. An important aspect of integrated planning is the need to align teams and content. You need to be able to share planning data with internal and external resources, so everyone is on the same page regarding objectives, KPIs and timing for activities. Customers expect a consistent experience across channels. This can be challenging when marketing teams work in silos, with different technologies, systems and processes. 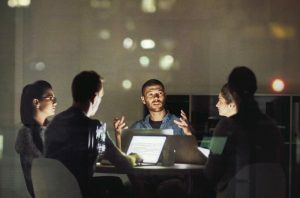 According to a Forbes report, 35 percent of organizations surveyed indicated one of their biggest challenges is that departments have technology and process silos. A consistent experience for all users. Seamless data flow across all planning phases. Deep user interface-level integration to enable easy transition across planning stages. Planning items enable you to define all metadata for plans, programs and activities using standard and custom attributes. This allows you to capture information for items such as timing, budgets, channels, target audience, offers, KPIs, product categories and brands. For some organizations, this forms the marketing brief for activities. You can restrict access to functional areas to ensure all stakeholders get visibility into the data appropriate for their role. The system supports both top down and bottom up planning for agile processes. You can plan across all channels and access an integrated calendar view to ensure timing makes sense from a business and customer perspective. Initiate custom workflows directly from planning items for processes like the creative production cycle. Workflows automate standard business processes to ensure completion of all required items in time to execute activities. You can share specific data from planning items with workflow task contributors to ensure all stakeholders get exactly the information they need to complete assigned tasks. Using standard workflows for the creative production cycle for all content can help provide a consistent brand message across all channels. When teams are aligned, it can help lead to better customer experiences. All approved content from workflows can be cataloged directly from the workflow user interface into the asset library. The asset library provides a single repository for all approved content across channels. Once you’ve completed the planning process, you’re ready to execute the plans. This may seem simple, but we’ve seen some marketers struggle to take marketing plans and programs all the way through execution. Often, there are broken links between marketing operations teams and customer experience/journey teams. Ideally, the planning data should be easy to reference or use to build execution tasks and activities to reduce the burden on campaign designers. One of the benefits of integrating planning and execution in a single system is the ability for planning and design data to coexist in a single execution task or activity. Planners can define the channels, target audience, offers, KPIs, schedules and budgets for execution tasks during the planning phase. Campaign designers can then use this data in the same execution tasks to complete the design phase. Additionally, designers can select approved assets directly from the asset library to build creative content across all channels. The integration of planning and execution reduces the time required to execute plans and minimizes mistakes resulting from manual data sharing between planners and designers. You can plan multichannel campaigns with execution tasks and activities across all channels. Once the planning is complete, designers access the same tasks to easily complete the design and initiate execution. Designers can easily use approved assets to build out creative content for web, mobile, and email interaction tasks. You can simply browse, search, and select assets to include in creative content. Building all creative content from a single repository of approved assets that have all gone through a standard review process helps ensure a seamless customer experience across all touchpoints. How many new customers can I expect if I spend $x? Which task or channel has the lowest cost/customer? Which creatives have the best conversion rate? 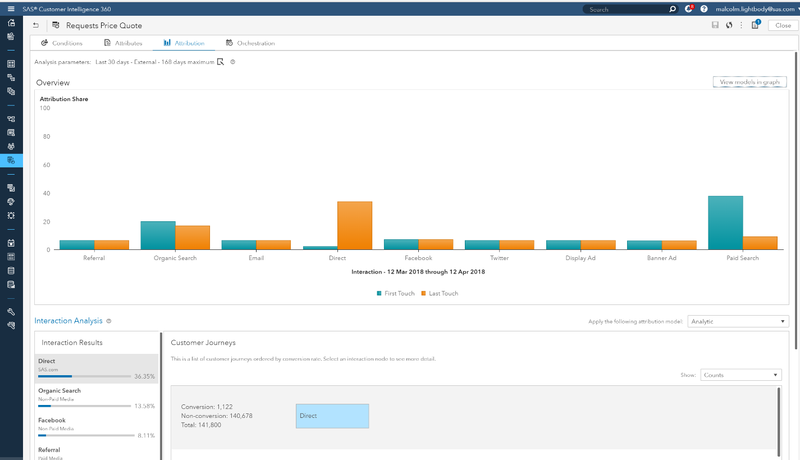 With the integration of planning and execution in SAS Customer Intelligence 360, marketers have the ability to tie all results back to planning items and content. This allows you to measure ROI for plans, programs and activities in a single interface. You can use these insights to guide decisions for future planning cycles. For example, you could use the results data to adjust budget allocation, channels, offers, or content for the next campaign. Giving planners an easy way to monitor execution results allows them to be more tactical and responsive to what they’re seeing in the market. Marketers want to be able to easily access analytical insights at the point of need. They don’t want to have to ask IT to make the required data connections to build a custom report to analyze some performance dimension. Insights need to be easy to consume at the point of need in the user interface with all the required data automatically connected. Analytics are most effective when they consider all data sources rather than just a few parts. For example, let’s say you want to maximize profitability for an upcoming campaign. Analytics can help provide recommendations for target audience, offers, and content based on past results. But the system needs a holistic view of all relevant data to make the best recommendations. The Asset Insights report above is an example of tying execution results back to content. The report is accessible directly within the user interface for all assets. These insights can help marketers select the best content for future activities. The attribution analysis report is accessible directly in the interface for any custom-defined business goals or data views. They provide insights into which channels contribute the most to a business metric. For example, you might want to analyze which channels are most effective in generating new accounts or leads. You could then use these insights to allocate resources to the most productive channels or interactions. SAS Customer Intelligence 360 is changing marketing planning by providing the connections needed for integrated planning, integrated execution of marketing plans, and integrated marketing analytics. With these capabilities, we enable you to deliver marketing plans with a purpose. Purpose-driven planning enables you to optimize marketing ROI and the customer experience. Jeff is a Principal Product Manager in the Customer Intelligence group at SAS. He is responsible for defining product strategy and working with R&D teams to build new functionality. Jeff has over 9 years experience as a product manager for enterprise marketing software solutions.